With a focus on the implicit and subtle transformation of materials, this 1,350 square foot retail environment is a natural place for consumers to look for objects from serious to whimsical, functional to esoteric, and complex to simple. Positioned off the main lobby at the heart of New York’s Westside cultural district, The Store becomes the perfect setting to showcase the Museum’s unique assortment of saleable art and merchandise. The space is wrapped on three sides by the building’s new glass façade. Iconic “lollipop” columns exposed from the building’s structural legacy provide pattern and mass to the space with both a shadowy exterior presence and strong geometric interior rhythm and form. 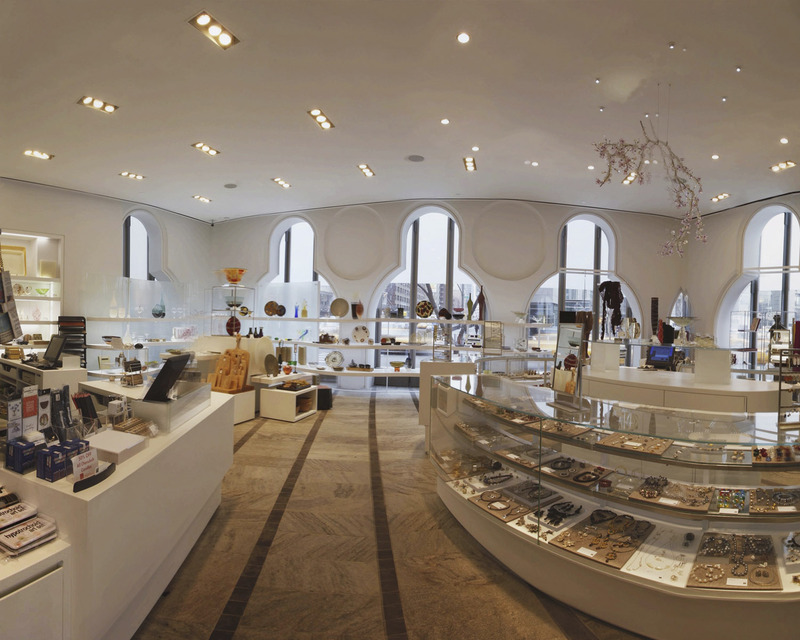 Key elements of the museum store include an elliptical curved glass showcase, ceiling mounted merchandising “trees” that provide innovative display space, and the main focal element; a 40-foot long organically-curved translucent glass merchandising installation that both showcases product and becomes an art object in its own right.